Cheeky Monkey Hosting Review 2019: Is Cheeky Monkey Hosting a Good Hosting? Cheeky Monkey Hosting started life in 2006 in Auckland, New Zealand. 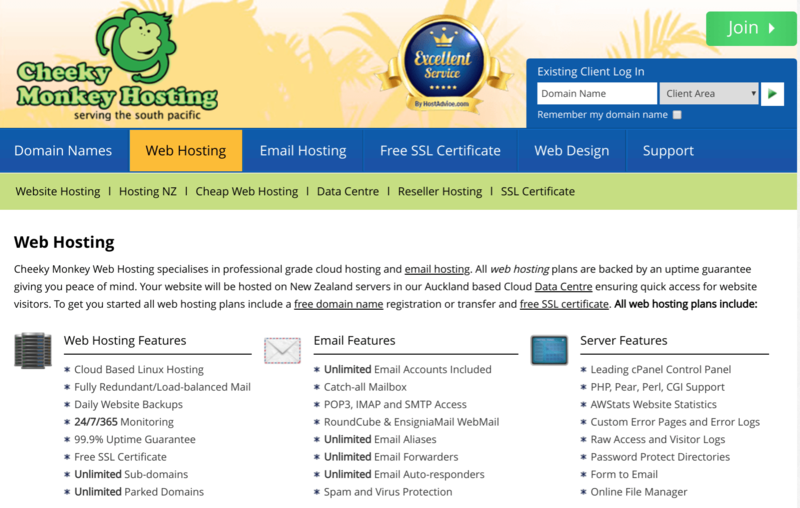 This web and email hosting vendor provides its services to small and medium sized companies across the South Pacific. Cheeky Monkey Hosting is a relatively small web hosting vendor, established in 2006, which serves small and medium sized businesses across the South Pacific from its head office and data center in Auckland, New Zealand. Their most popular hosting solutions include web hosting, domain name registration, and personalized email services. All Cheeky Monkey Hosting servers are housed in their premium Tier 1 data center located in New Zealand. The servers use modern technology with emphasis on security and stability, and they are monitored 24/7 by on-site technicians to minimize any interruptions to clients’ websites. Data centers are powered by an uninterruptible power supply (UPS) backed by a diesel generator, with protective air conditioning and fire systems. All Cheeky Monkey’s packages include free SSL Certificates. In terms of physical security, Cheeky Monkey Hosting has put in place a video surveillance system, intrusion alarms, and security patrol guards. Data and website backups take place every 24 hours, but they do not guarantee the accuracy of the website copies or the success of any restoration attempt. The email hosting services are pretty advanced and incorporate an array of features including unlimited email accounts, IMAP and SMTP, Roundcube Webmail suite, catch-all mailbox, unlimited email aliases, unlimited email forwarders, and unlimited email auto-responders. Cheeky Monkey Hosting’s prices are pretty cheap compared with other hosting providers in New Zealand, especially when you consider their advanced features. All the prices for monthly or annual plans are listed in New Zealand Dollars. While customers are promised a 99.9% uptime guarantee, the vendor does not have a compensation plan in case of downtime. Nor is their any detail about a money-back guarantee. Technical support can be accessed via telephone, ticket, email, or social media. There is no live chat, and their customer support is only available during business hours (except for urgent service related matters) from 9 am to 5 pm New Zealand time, Monday to Friday. Their knowledge base is quite comprehensive with a relatively detailed FAQ section but no video tutorials. With their data center located in New Zealand, Cheeky Monkey Hosting would best serve small and medium businesses in the South Pacific. While they have the hosting infrastructure, expertise, and experience to handle most small businesses, there is nothing on their website to suggests they could handle the hosting demands of big corporations. Wondering how Cheeky Monkey Hosting stacks up against other Web Hosting companies? Enter any other Web Hosting company and we will give you a side-by-side comparison.